I often tell my students that an artist’s education doesn’t end with the finish of one’s school years. For a figurative artist especially, it’s a life long pursuit, observing and learning about the human form and the landscape, evolving a greater understanding of our forms and psychology and the settings that surround us. And whatever your artistic goals---whether you are utilizing the figure for abstractive, expressive or realistic purposes--- all of this is coupled with the necessity to constantly exercise your eye-hand coordination, drawing at least a little bit every day throughout your life, so that you can better translate your brain and eye’s goals through your hand. Of course, you have to start some place in your education as an artist. 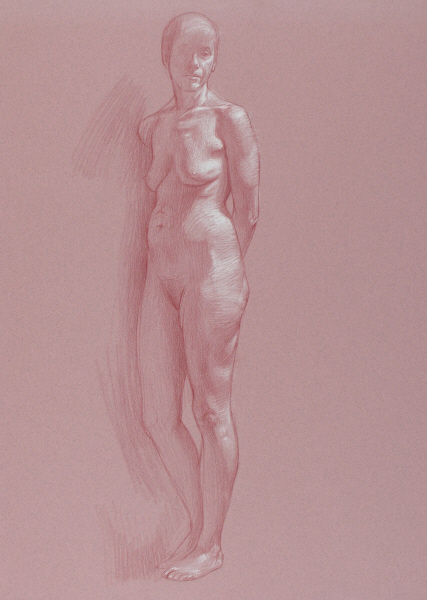 Traditionally, many art academies of the past and present steer their students toward making copies of the masters, first starting with the study of master drawings from reproductions, moving to drawing from plaster casts until, finally, the students graduate to working from life and the living, breathing human form. Although certainly effective, I advocate a less linear approach. I encourage my students to work from life immediately, so that from the very beginning, they feel the gut level passion and excitement that comes from working from a living breathing human being. This way, you also start to experience some of the value, proportion and line problems that are associated with life drawing and painting. Then you can turn to master drawings as a sort of “answer book” to see how the experts solved the same problems you encounter in the studio. And while cast drawing is usually associated with “novices,” many mature artists frequently return to cast drawing to upgrade their understanding of values. Even many of the early artists from the Renaissance and Baroque period did this, drawing from the then recently excavated Greek and Roman statues. I often tell my students to draw from marbles when they have a choice---preferably statues illuminated by a single light source. Like the plaster cast reproduced here (by Belinda Jouet, student of Kenyon Cox), marble statues are nearly white and devoid of the colors that normally confuse the artist’s study of values. 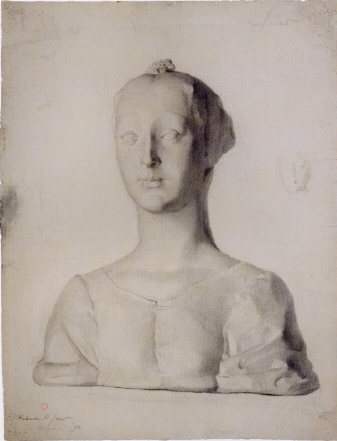 But marble sculpture has a decided advantage over plaster casts. Like skin, marble is slightly translucent, so that light seems to shimmer through the upper portions of their surfaces. Highlights and shadow edges will glow on both human and marble surfaces, while on the more opaque skin of the plaster casts, they will seem flatter, more matte--- and comparatively lifeless. Nonetheless, it is still useful to work from plaster casts since they are so readily available, and they will definitely serve your purposes. There are many ways to approach the study of the human figure when drawing directly from life. I urge my students to balance their training with a combination of fast and long drawing exercises. It’s helpful to make a lot of quick, gestural drawings to better drill your understanding of the proportions of the figure. And while an evocative gesture is at the core of all powerful long pose drawings, it’s equally important to learn how to “render” or replicate the light and dark value changes on the human form if you have realist aspirations. 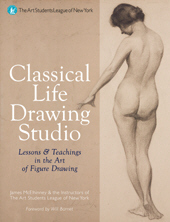 When attempting a sustained drawing, I advocate a rather traditional approach, which you will see in many of the historic figure drawings reproduced in this book. I tell my students to broadly lay in the big shadow shapes, outlining shadow edges with faint, delicate lines at first. Then begin laying in the many light and shadow shapes, starting at the top of the figure and progressing downward until you finish it or until you run out of time. For me, the meditative state you can get into as you meticulously render the human form is a rather special experience, and there is something rather beautiful about a “half finished” drawing that often results from this slow, gradual approach. Most artists render these sustained drawings in charcoal, graphite, crayon and chalk. Yet, long pose drawing is not limited to dry media alone. You can often achieve a broader range of value contrasts with paint, working on canvas in a monochrome manner called the grisaille method. Remember, life is not confined to the model stand and neither is the discipline of drawing. It’s important to carry your sketch book with you, drawing people wherever you go, in restaurants, on the bus or subway, even from TV if the subject matter is compelling to you. The important thing is to practice always, looking at life, not just as an academic study, but also as a visual quest, gathering information, ideas and inspiration for your more finished paintings, drawings, sculptures and printmaking or as finished works of art in themselves. Click Here for PDF of essay as printed in book. Click on above images for higher resolution.